Rattan is typical climbing palms tree that being used as the raw material for cane furniture industry. 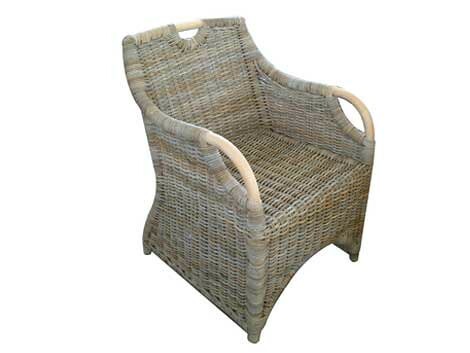 There are over 600 different species of rattan have been recognized, which is belong to 13 genera. Most of rattan is growth in tropical rain forest, where in much of South-east Asia is represent the most important forest product after timber. Some people are sometimes get mistaken between rattan and bamboo, which both are different. Cane is usually be distinguished because they are solid, whereas bamboos are almost always hollow. The trade in rattans and canes is thought to be worth about £3 billion annually. Looking at the characteristic of rattan, rattans have long and very flexible stems that need support. In favorable conditions, some species will grow to very great lengths. The longest cane ever recorded was over 175 m long. Some species are single-stemmed while others are multi-stemmed, single-stemmed species providing a single harvest while the multi-stemmed species can be harvested sustainable. As well as the sheath spines, rattans usually have whips, either on the leaf sheaths or at the ends of the leaves. These whips are armed with grouped, grapnel-like spines and play a major role in supporting the rattan as it climbs into the forest canopy. It is these terrible whips and spines that make the scientific collection of rattans so unpleasant and are in part responsible for making this a poorly studied and still only partially understood group of plants. At the surrounding of the stem are sheathing leaf bases which are nearly always fiercely spiny, the spines sometimes arranged in neat rows and interlocking to form galleries in which ants make their nests, providing extra protection to an already well protected plant. This may prevent animals from feeding on the tender growing point (or ‘cabbage’), hidden within the leaf-sheaths. Talking about harvesting and processing rattan, it can be done together and it needs to pull the canes down from the forest canopy and remove the spiny sheaths, leaves and whips. This leaves the bare cane of commerce. However, rattan-harvesting is thus a rather dangerous business, the dead branches can be dislodged as the rattan is pulled, this can make the ants and wasps can often be disturbed in the process. The bare canes are carried out of the forest and partially processed before being sold to middlemen. The small canes are dried in the sun and often smoked over burning sulfur, while large canes are boiled in oil which is often a mixture of diesel oil and palm oil, to remove excess moisture and natural gums, and to prevent attack by wood-boring beetles. Rattans can be used for a very wide range of purposes. The most important that being in the manufacture is baskets and mats. It being trusted, that rattan are remains the most important source of material for making baskets and mats in the South-east Asian region. However, as the wild resource becomes scarce, other materials such as split bamboo are used as substitutes.